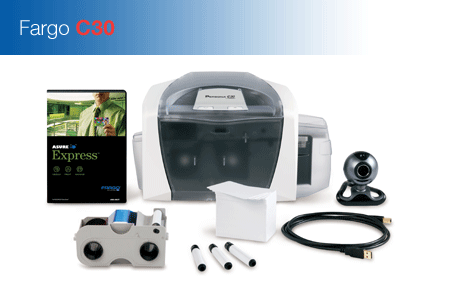 Fargo C30e The simple way to personalize photo ID cards. The simple way to personalise photo ID cards. Persona by Fargo is all about simple, reliable, and affordable ID card printing. Persona ID Card Printers are designed for everyone who wants to make great-looking plastic ID cards, but doesn’t need cards with high-security features. Persona delivers sharp, colourful, durable plastic ID cards for hundreds of applications, such as company and school IDs, access cards, and membership and customer loyalty cards. Magnetic stripe encoder - 1, 2 and 3 track.